Scott Fritz is back with a new series dedicated to introducing you to Version 3 of PreSonus Studio One! This series will show you everything you need to get started and find your way around. Scott goes through Studio One 3 inch by inch, covering all the needed basics such as Activation, Audio Device Setup, Creating a New Song or Project, the New Browser Window, User Interface Overviews and more. Scott then goes into deeper topics such the Tools and Menu Bar, working in the Arrange window, the new Scratch Pad and Arranger tracks, the new Instruments, Recording Audio & MIDI, Working with Audio and MIDI, the Project Page Mastering area and more! Groove 3.​ continues the greatness with this, part two of their new series of Studio One production tips! In this, the second episode of the series, the guys share their secrets on getting human-sounding drum sequences using an electronic drum kit to trigger Superior Drummer and Steven Slate Drums. Check out more great tutorials at http://www.groove3.com! 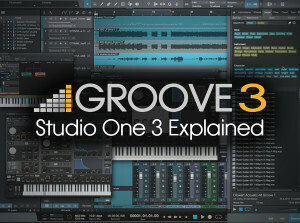 Groove3 has a great new series brewing chock full of Studio One production tips. In this, the first episode of the series, Scott from Groove3 takes a moment to list off what we’ll be learning before discussing how he has the session set up, and taking a full listen to the song that we’ll be working within coming episodes of the series. 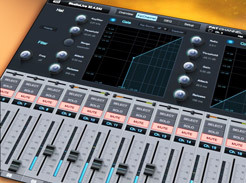 The StudioLive AI Mixers, like many of our products great and small, ship with Studio One Artist. For a limited time, you’ll be able to upgrade the included copy from Studio One Artist to Studio One Producer for free. Update 7/17/14: In related news, SAE Institute just announced free StudioLive AI training in select cities. Click here to find out when they’re rolling through your town. Both Studio One Artist and the upgrade to Studio One Producer are worth $99, so, that’s like getting $200 of free software. Studio One Producer includes significant feature upgrades from Artist, including MP3 import/export, virtual instrument support, and a whopping 16 gigs of bonus content. I’m not sure how we greased this, but somehow we smooth-talked the sharp dudes at Groove3 to include their “StudioLive AI Hardware Explained” video series, a monster 47-part series that would ordinarily set you back fifty bucks. While that alone is a steal at around a dollar per video, we like to think that “free” is an even better deal. This package will put you leaps and bounds ahead of the guy who buys a vanilla StudioLive AI mixer. With Studio One Producer and an exceptional training video series ready-to-go as soon as you open the box, you’ll be hitting the ground sprinting instead of running. Oh, and if you’re still on the fence about getting a StudioLive AI or not, this video might clear up some of your hesitations. Incredible New StudioLive AI series from Groove3! 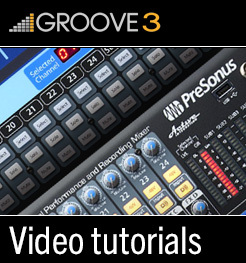 Check out this incredibly comprehensive series of videos from the geniuses at Groove3. These guys have broken down the StudioLive AI workflow into easily-digestible bite-size pieces. First-time-buyers will find everything they need to get connected and running on the StudioLive AI, while seasoned audio vets can skip straight to the chapter on ringing out monitors. The incredibly thorough Groove3 has left no stone unturned here, and have also taken on VSL, remote mixing, Smaart wizards, and the AI family’s integration with Studio One. 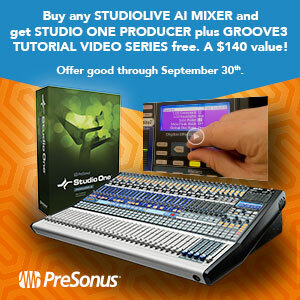 Click here to check out the StudioLive AI series from Groove3 with some free videos. Enjoy! New StudioLive AI Training Videos from Groove3! Check it out! Our good friends at Groove3 have just launched a great video tutorial series on the new StudioLive AI digital mixers! This thorough overview will show you all the StudioLive AI essentials and beyond, all in trademark Groove3 style—It’s like having a pro audio coach right there at the mixer with you. • Tutorials written by Studio Live AI Expert William Edstrom Jr.
Click here for the entire series!